Plant hunter Robert Fortune discovered this lovely species in 1855. It is a fragrant rhododendron...but unlike those sweetly scented, tender beauties lindleyi, nuttallii and maddenii, R. fortunei is quite hardy. Fortune's original collections were made in Chekiang Province, in eastern China, at about 3,000 feet. Other plant hunters later found the species in Anhwei, Kiangsi, and Hunan Provinces growing in woods and forests at 2,000-4,000 feet in elevation. Plant hunter Robert Wilson noted that the species was common on other Chekiang mountains, particularly in the Lu Shan range of the neighboring province of Kiangsi, to the west. The leaves of R. fortunei are handsome, and show some variation. They are 3 to 7 inches long, 1.5 to 3 inches wide. A prominent and very attractive feature is the deep red of the midrib and petioles (leaf stems); these create a ring of color around the dormant bud that seems to deepen and become more conspicuous in winter. The leaves of the Lu Shan form are typically a dull, olive green in color, and have rich red petioles. The flowers of R. fortunei are borne in a loose truss of 5 to 12, and are shaped like wide bells...funnel-campanulate. They are pink to pale pinkish-lilac or rose and are fragrant. R. fortunei has been much used for hybridizing, particularly in North America, and especially in the East...where it is appreciated for its tolerance of summer heat and winter cold. The two great hybridizers, Rothschild and Dexter, made free use of it this rhododendron as a parent. Indeed, one of the most loved hybrids of all time in eastern North America is Dexter's 'Scintillation'. It is noteworthy that a particularly fine large flowered, sweet-scented R. fortunei clone was used as the seed parent of the original 'Loderi' hybrid grex. 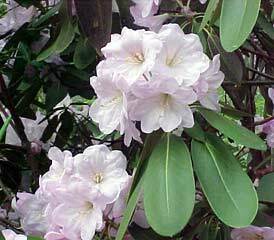 The other parent is R. griffithianum; a tender rhododendron found growing in the lower elevations of the Himalayas.